Social media are permanently changing the nature of politics across the world. What are the implications for democracy, representation and governance? 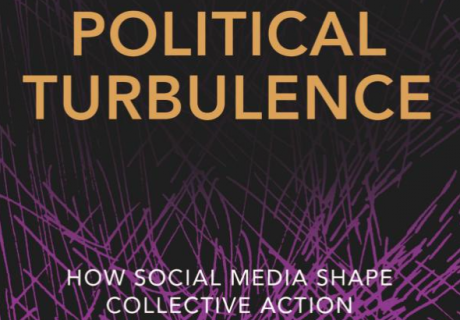 Political Turbulence: how social media shape collective action, Princeton University Press, £19.95, by Helen Margetts, Peter John, Scott Hale & Taha Yasseri. A few years back I was intrigued and captivated, as a largely analogue political animal, by Paul Mason’s Why It’s Kicking Off Everywhere on the revolutionary part that social media were playing in the Arab Spring and global politics. But for all the enthusiasm, anecdotes and insights, it was ultimately unsatisfying. Here now is a revelatory study, Political Turbulence, which looks more closely and systematically at why “it” – that is, significant collective action – “is kicking off”, and why, much more frequently, it doesn’t. Helen Margetts, Professor of Society and the Internet at Oxford and head of its multi-disciplinary Internet Institute, is the lead author. I have been lucky enough to work with her on a series of democratic projects, and she has given me a copy of Political Turbulence as a gift. It is a gift that I want to share more widely, fearing that a political science book – even one that breaks free of academic boundaries – would not reach the wider audience interested in political change that it deserves. This dense book explores the digital traces of individual and shared acts of political participation amid “big data”, and describes a series of experiments in the authors’ attempt to uncover the way widespread use of the internet and social media is changing society, politics and the economy across the world. This isn’t an idealistic enterprise, but a study that interrogates its own data rigorously, seeking to discover how and why the chain reactions caused by “tiny acts” of participation – tweets, re-tweets, petitions, liking and sharing, a posted photo of a drowned child on a Turkish beach – mobilise people into collective action, at local, national and global levels, and how and why most mobilisations fail. At the root of the new turbulent politics is the sharing of social information, as Mason argued, which Margetts et al demonstrate can make mobilisation more demotic and at the same time more volatile. The result, they argue, being unstable and unpredictable mobilisations and a form of political life which is permanently unstable and unpredictable too. The “big data” that they analyse reveal what people think, do and might do, unordered by opinion polls or focus groups, and frees them to act as they choose outside existing structures and political organisations. Of course, some mobilisations have spilled over the existing structures, setting them aside in revolutions, but they have also found places within those structures, transforming the politics of countries, as Podemos has done in Spain, and party politics elsewhere, as in the Corbyn surge in the Labour party here in Britain. In particular, the authors find that the “tiny acts” of participation on the now readily available social media serve to draw people into politics who wouldn’t have participated previously. Social media mobilisations have one thing in common – a surge of activity among social groups traditionally regarded as those least likely to participate politically, such as the young and members of ethnic minorities. But they are up against it in the UK. Just consider our political structures – an obsolete and disproportionate electoral system; an electoral register on which the young, ethnic minorities and urban dwellers are disenfranchised; biased conventional media; political parties run by overlapping oligarchies who despise their own members and who seek a monopoly of political action and control of the over-powerful state; a deep security state; and corporate and financial power overshadowing the political world. Here is an entrenched conspiracy against the wider participatory and pluralist politics that the social media are uncovering and facilitating below the surface of the Westminster village and the BBC Radio Today programme. The authors rightly reject mainstream political scorn for actions and campaigns in the online political world as inferior to offline activity and participation, as being too easy; whereas “real politics” demands (on the left for instance) attending boring Labour Party GCs, distributing usually unread leaflets on cold and rainy days to unresponsive households, chanting and protesting with placards held high outside Conservative headquarters. I am not dissing conventional political activity; it can be fun, engaging, comradely, and reach out to the public. But social media are re-shaping the political world within which citizens and party activists operate, seek and find political information and come to their decisions about how to participate. I wonder how many politicians who scorn the easy access to campaigning that the social media give also bemoan the lack of public trust in their own political parties or organisations. For those of us who will hope that the social media might release gravitational waves upturning political and economic oligarchy and creating a more equal and open society, answers to the questions the authors pose are not (as you would expect) hopeful. As they say, the classic pluralist idea foundered on the unequal contest between the powerful and the weak (an inequality that is all the more pronounced today), the power of the state and the difficulties of collective action in large groups. And while these problems may be less severe in the case of “chaotic pluralism”, they endure. Inequalities in wealth, education and class and family networks still skew effective political participation from below. The state remains the central broker in negotiations between established interests, mostly its allies, and newly mobilised groups within a corporatist framework. The authors make the third limitation – the difficulty of sustaining mobilisations that lack leaders, institutions and organisation – a key theme of the book. Another theme is the need for political science in the future to explore data in a broader context than the narrow world that political scientists inhabit. The Oxford Internet Institute works in the social sciences part of the university in its efforts to understand digital life or life online. The view there is that the sheer amount of data that we now generate makes cross-discipline research vital. Margetts and her fellow political scientist, Peter John of University College, London, therefore undertook the book with Scott Hale and Taha Yasseri, a data scientist and computational social science researcher. Helen Margetts says that scholars must now start looking at political systems more like chaotic natural systems, like the weather, in multi-disciplinary teams with large scale data. I am all for shaking up the tired discipline of political science. Those of us outside don’t need a weather man to tell us which way the wind blows. But we could do with a deeper, more engaged and scholarly understanding of the politics around us.